These days, the word ‘silicone’ frequently comes with a sign of exasperation as thoughts turn to how hard the bottom line is going to be as prices for the material continue to rocket. Silicone is a base material used to facilitate the production of everyday items across a vast range of industries including, medical, household electrical and many more. The rising cost of electricity in China, a major global provider, plus the price of crude oil, means suppliers are finding that their profit margins are being squeezed. This, along with increasing pressure to meet growing global demand, has seen the price of silicone soar by over 50%. For print providers, the situation is no different. Silicone is frequently used as a lubricant in the print process, remoistening paper, protecting from friction and ensuring print quality is maintained at a consistently high level. It is an essential part of the process and often accounts for large expense in the business, with large offset lines spending around €100k on silicone a year! Any increase can see material costs escalate and hit margins hard. A number of forward-thinking print providers are seeking alternative solutions to safeguard their businesses. Answers come in various forms including the integration of an all-in-one silicone applicator and remoistening system such as the Contiweb Fluid Applicator (CFA). 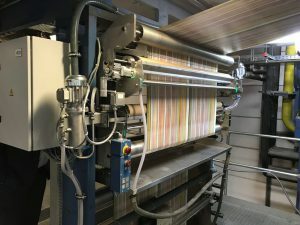 Typically, companies would have two separate devices in each press line – each with a sole purpose, one to apply the silicone and one remoisten the substrate. Designed as a standalone system, the CFA combines both functions in one and adds the unique ability to create the mixture directly in the system. This allows print providers to reduce their hardware costs and streamline their workflow. From a consumable perspective, systems like the CFA can unlock huge savings. Conventional systems use a silicone emulsion. This ready-made mixture is often very expensive and can see consumable costs escalate. In contrast, the CFA uses a pure silicone oil. This high-grade raw material ensures that print providers only need to mix a small amount with water and surfactant before being applied. The oil lasts much longer than an emulsion and provides a more cost-effective solution, as silicone consumption is reduced. In fact, systems like the CFA can see print providers reduce silicone consumption by more than 80% while securing them a financial saving of more than 60%! Beyond cost savings, the use of silicone oil also offers additional quality and workflow advantages. Take for example the lubrication: the silicone oil outputs large drops of oil which are slowly absorbed by the substrate compared to the fine droplets of a silicone emulsion. This means that less oil is required to achieve a good lubrication and further streamlines operational cost. In terms of quality, the oil produces a film on the applicator roller, which drastically reduces the risk of ink picking and ensures a consistent, premium product. As Henry Ford once said, “If you always do what you always did, you’ll always get what you always got”. In other words, unless you’re willing to step-out of your comfort zone and think outside the box, you’ll always find yourself restricted by the same bottlenecks. Download our extensive whitepaper and find out how the Contiweb Fluid Applicator works!